To understand the complex web of deceit aimed at luring the American people and the rest of the world into accepting a military solution which threatens the future of humanity, get your copy of Michel Chossudovsky’s international bestseller America’s War on Terrorism. 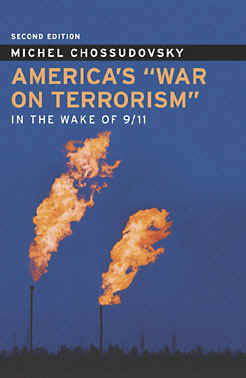 In this second edition of Michel Chossudovsky’s 2002 best seller, the author blows away the smokescreen put up by the mainstream media, that 9/11 was an attack on America by “Islamic terrorists”. Through meticulous research, the author uncovers a military-intelligence ploy behind the September 11 attacks, and the cover-up and complicity of key members of the Bush Administration. The expanded edition, which includes twelve new chapters focuses on the use of 9/11 as a pretext for the invasion and illegal occupation of Iraq, the militarization of justice and law enforcement and the repeal of democracy. In these unprecedented economic times, the world is experiencing as a whole what most of the non-industrialized world has experienced over the past several decades. For a nuanced examination of the intricacies of the global political-economic landscape and the power players within it, order your copy of America’s War on Terrorism. 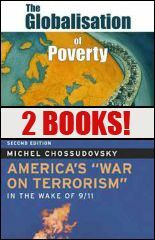 Purchase both of these bestselling titles by Michel Chossudovsky for one low price! Michel Chossudovsky takes the reader through an examination of how the World Bank and IMF have been the greatest purveyors of poverty around the world, despite their rhetorical claims to the opposite. These institutions, representing the powerful Western nations and the financial interests that dominate them, spread social apartheid around the world, exploiting both the people and the resources of the vast majority of the world’s population. As Chossudovsky examines in this updated edition, often the programs of these international financial institutions go hand-in-hand with covert military and intelligence operations undertaken by powerful Western nations with an objective to destabilize, control, destroy and dominate nations and people, such as in the cases of Rwanda and Yugoslavia. In this expanded edition of Prof. Michel Chossudovsky’s international best-seller, the author outlines the contours of a New World Order which feeds on human poverty and the destruction of the environment, generates social apartheid, encourages racism and ethnic strife and undermines the rights of women. The result as his detailed examples from all parts of the world show so convincingly, is a globalization of poverty. In this updated and enlarged edition – which includes ten additional chapters and a new introduction – the author reviews the causes and consequences of famine in Sub-Saharan Africa, the dramatic meltdown of financial markets, the demise of State social programs and the devastation resulting from corporate downsizing and trade liberalization.